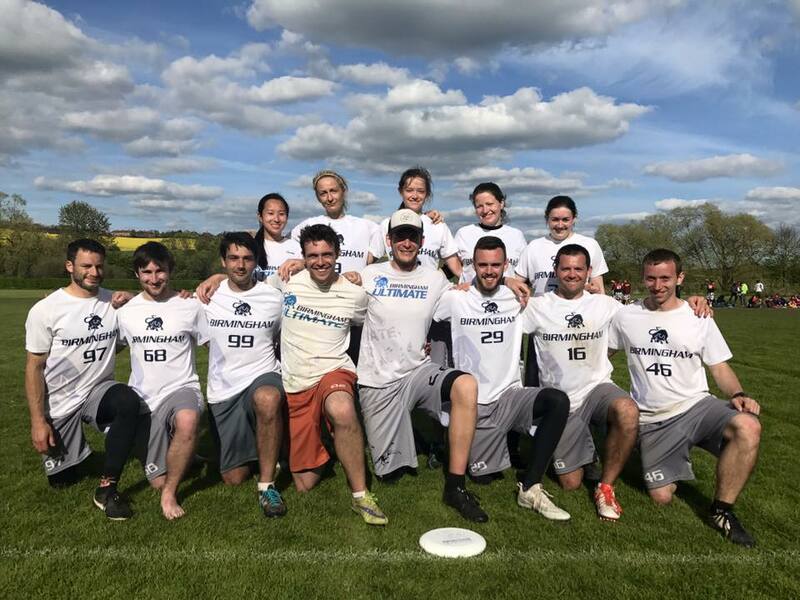 After a strong performance at Mixed Tour 1 – going undefeated and winning spirit – we travelled to Durham seeded 10th; at the top of the bracket and needing to defend our position at the top before having any chance to move up. We knew it wouldn’t be an easy task in a pool with St. Albans, Glasgow 2 and the unpredictable GB U24 Blue team that could look very different from their namesakes at Tour 1. We started against Glasgow 2 on Saturday morning with the faintest hint of upwind/downwind conditions. Early on the game was even and we traded points as we got our bearings and began to edge up the pressure. Once we had taken advantage of a couple of mistakes they started to rely more on their long game, connecting on a couple of big hucks, but once they had shown their intentions we managed to start shutting it down and extend the lead to a 15-7 win. Next up were St. Albans; both teams took a while to find their rhythm and some long points ensued to begin the game. We were getting turnovers but just not quite converting on them, and it wouldn’t be surprising if they were saying the same thing about us! Luckily though, we started converting before they did and once we had a stranglehold on the game we were able to take it away from them to a less comfortable than it sounds 15-4 victory. In our final game we were up against GB U24 Blue to decide who would top the pool and get a chance to cross up into the top 8. A couple of Brum players were lining up against us and we therefore knew that they would have a game plan to stop us. Playing familiar faces and expecting tough opposition we probably started to overthink the game and so had a very hot and cold start. Unfortunately the pattern continued throughout the game, each team going on runs of 4 or 5 points to wrestle back the lead. The cap came on at the right time for them as they had the momentum to take them to a 7-10 win, and left us frustrated at what could have been. With our first loss of the mixed tour season, the chance to get into the top 8 was gone and meant that whatever happened now we were going to be finishing below where we started the weekend. Now playing for 13th we had something to prove – mostly to ourselves. Sunday morning came around and we had drawn SMOG 2 in the 15v18 quarter final. Playing against the home team on the lovely 3G pitch we were determined to start strong and not let them get a foothold in the game. A couple of points in and we began to turn the screw, forcing mistakes and making the most of our opportunities, we took a nice lead and were feeling pretty good. SMOG had other ideas though and inched their way back into the game and we really had to battle to close the game out, but close it out we did: 12-8. Cosmic Manatees were the opposition in the 14v15 semi-final and as with any team from the Brighton area they presented a different challenge. Despite there being little to no wind, they came at us with a zone and we made hard work of it to begin with before starting to find our way. We also started to stifle their offence and the combination of the two turned the game in our favour. From there we saw it out 15-6 but it never felt comfortable. The final game then was against Thundering Herd 1, who had also been ousted by a GB U24 team in the pools and wanted to show that they should’ve been higher up. This was a very closely fought game and every time we got a lead they came right back at us. As time expired we were 3 or 4 points up and needed only one more to end it. However they were not giving in and scored 2 or 3 on the bounce to lengthen the game, as our legs tired and we misfired on a couple of shots to the endzone in an attempt to win it. Eventually though, one of our deep shots came off and we emerged with a 14-12 win, had the game gone on much longer though they would’ve probably nicked it from us. Overall it was a fantastic weekend of Frisbee with just the one loss which limited us to 13th place. A single dropped game over two Tour weekends isn’t a bad record and we’ll be trying to build on that at MT3 in a couple of weeks.